I would guess many people use a tent of some type. Others may sleep in their vehicle if it is large enough or has been specifically retrofitted for that. In Big Sky country, I suspect some sleep under the stars using a simple tarp and bivy. For me, it has mostly been a backpacking tent which is designed to be minimalist, light, and small. It serves its purpose but affords very little luxury. I have several backpacking tents but currently am using a Six Moons Designs Lunar Duo. They call it roomy for one but I would beg to differ especially when I'm hauling extra gear that we all have specifically for sasquatching. 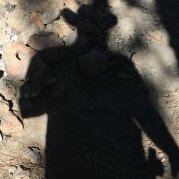 In some areas I sasquatch in, there are lean-tos and I always use them as they provide shelter without having to carry a single additional ounce in your backpack. When I can reach an area with a 4x4, I luxuriate in my Cabela's 8-man Alaskan Guide tent. Love that tent. It is the bomb. Roomy, I can stand up in it, and will withstand just about anything Mother Nature can throw at it. Just this week, I ordered a new tent that I'm hopeful will revolutionize my outdoor adventures. It is a 4-man tipi (versus a pyramid) from Seek Outside that allows the ability to "hot tent". It has a stove jack so I can carry a wood stove with me. It will very comfortably house two people, stove, wood, and all the gear you have. The total weight of tent and wood stove will be light enough to be backpacked alone but can be split with another person when a friend joins me. It's tall enough, at 6'10", to be able to stand up in it (PG - you'll need the 6-man tipi !!). Best of all, I can run the wood stove and dry clothes, boots, gear, and cook. On cooler or cold nights, I'll be able to sit in the tent in a teeshirt in 80F conditions rather than cocooned in down clothing and fleece in sub-freezing temperatures. Pretty excited about this new tent. It is light enough to backpacked alone, will provide a ton of space (including head space) compared to what I am used to, and will allow more comfortable arrangements in colder months. In warm months, I'll ditch the Lunar Duo and backpack with this tent. What do you folks use for housing arrangements while out in the field? If backpacking I use a backpacking tent. I am considering a hammock with a built in screen. Car camping I use an 8 person instant up tent. Even when alone. I sleep on a cot, bring a folding table for a desk. I sleep with all the windows open so I can see out at night. 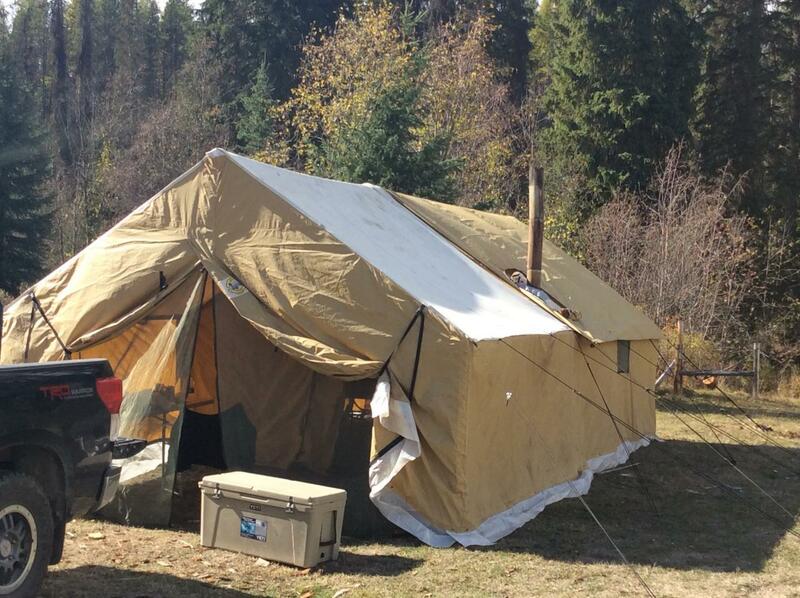 I also use the Cabelas Alaska Guide 6-man tent; the one 6’ tall inside. I used to use and really like the Eureka Timberline 6-man tent, but that tent simply cannot stand in Alaskan wind storms above tree line. As the name implies, you’d better use it below timberline within the shelter of the forest. It has collapsed on me in three different trips above tree line. The Guide tent can be a true PITA to set up when alone and if breezy, but once you have all the poles set up, it stands up to wind very well. I also sleep on a cot with a pad for warmth. I have “heavy” cots (including, of course, Army surplus) and light weight cots, one of which is really small and used for quick bivouacs. I never “backpack” anymore. There really hasn’t been any need to do so in Alaska. Even now relatively few places are legally off-limits to motorized vehicles, and huge areas are wide open, so that’s where I go. Of course, backpacking allows access where your rig cannot go, but an Argo can go where most folks can’t or won’t walk........like across rivers. That Argo also carries a very comfortable camp with spare cargo area galore. I’ve used the Argo to go up to 50 mikes off road (Andy I do mean “off road.......not down logging or mining roads), then wandered another 10 miles on foot from my base camp. In such cases, not intending to be away from base camp longer than two nights, I tend to tarp rather than use a backpacking tent, but I should look into the modern backpacking tents. My base camp always fearures two tents; one for sleeping, and one for cooking/eating/food storage. I set them up at least 30 yards apart. The reason should be obvious; bears. If Mr. Trouble shows up, I want him concentrated on the cook tent where I can blow him away in relative safety. The cook tent is a floor-less ice fishing tent. In the dead of winter on ice fishing trips, unless I’m planning on being there more than two nights, there is no need for two tents. I just bring the big ice fishing tent and sleep on a cot in it along with fishing, cooking, etc. If I’m staying on the ice for three or more days, I sleep and cook in an Arctic Oven and leave the ice fishing tent for fishing. The Arctic Oven is ruby a remarkable tent. I heat mine with a vented propane heater. I would not hesitate to camp at the North Pole in this tent, given enough propane and enough men for 24/7 polar bear guards. This tent is overkill in September, and given its weight, it’s pretty much an Alaskan winter tent. The downside is finding a flat spot big enough to set it up. Ive thought about building a wood deck on the ranch for it and just throw it up for family or company like a cabin. That's a house, not a tent! I use a 30+ year old dome style tent, bought back in the '80s at Canadian Tire. I think it's "Northwoods" brand. Waterproof floor is about 8' in dia., and height is 7' at the centre, so lots of area to stand fully erect. 3 pole arches, plus a short pole to spread the entry "brim", and a full fly. I don't backpack, so weight is not a huge issue. It could sleep 4, maybe more, but I've never had more than 1 person share it so tons of room for gear. I sleep on the floor, using a self inflating air mattress with a torso size roll up foam pad on top, and a mummy bag. Due to age and recent surgery, I'm seriously considering a cot for future trips. Is the hot tub around back? If I leave the pole set behind and cut ridge poles? I can pack it in with a mule! School me please. What's the difference between a tent and a "wall tent"? A wall tent is commonly square or rectangular and has vertical walls on all four sides going up to meet the pitched roof........kinda’ structured like a house rather than a domed, teepee, or pup tent type of structure. Wall tents tend to be larger, heavy, and feature stove jacks that allow exhaust venting through the roof or wall for a stove. If used with an inner liner, a heated tent can easily be warm enough for long term shelter in the coldest conditions, and wall tents have been commonly used for over-wintering over the past 150 years or more. 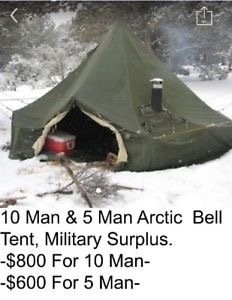 Many years ago I bought a surplus Army 5-man Arctic tent complete with arctic liner, pole set, Yukon stove, and exhaust venting. This model is pictured below. I paid $300 for it. I put the whole setup in two 55 gallon overpack drums and stashed them in the woods on my property. I wanted an emergency, heated shelter that could be set up quickly and would be accessible if an earth quake crumbled my home on top of all my camping gear. The Yukon stove was designed to burn diesel, gasoline, JP-4, wood, or coal (but burning gas was just begging for a tent fire.........we used to mix gas and diesel for a safer, hotter fuel). As you can see, the tent has short walls, but the roof design is more teepee-ish than a gabled pitch seen on wall tents. The Army design would shed snow better, but it would not provide as much good standing room inside. With the Arctic liner and stove, one could sleep comfortably in -60F temps. I’ve done it. Save for some modern materials, velcro, netting, etc. A wall tent is virtually unchanged as Huntster says for 100s of years. A wall tent has vertical walls, where a normal tent is like a roof sitting on the ground. Which makes them much more livable and useable space, like a cabin. 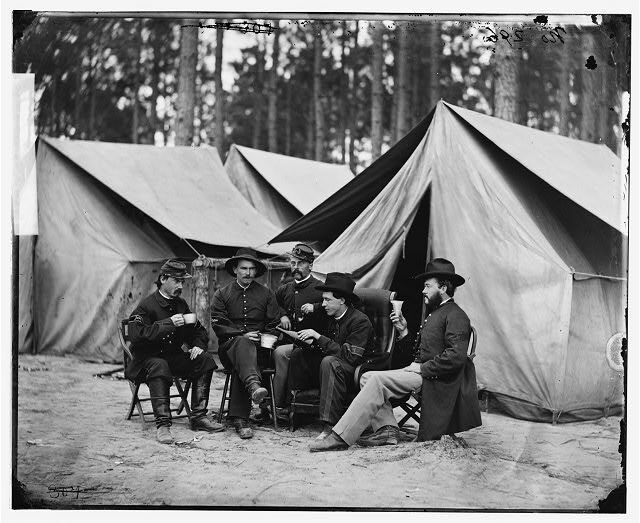 I believe this picture is during the Civil War.